Richard Hoffman has published four volumes of poetry, Without Paradise; Gold Star Road, winner of the Barrow Street Press Poetry Prize and the Sheila Motton Award from The New England Poetry Club; Emblem; and his new collection Noon until Night. His other books include the celebrated Half the House: a Memoir, published in a 20th Anniversary Edition last year, the 2014 memoir Love & Fury, and the story collection Interference and Other Stories. His work, both prose and verse, appears in such journals as Agni, Barrow Street, Consequence, Harvard Review, Hudson Review, The Literary Review, The Manhattan Review, Poetry, Witness and elsewhere. 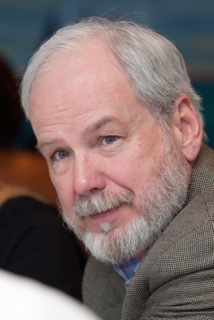 A former Chair of PEN New England, he is Senior Writer in Residence at Emerson College in Boston. This conversation took place at 7.pm, West Yorkshire (GMT) and midday in New England. Both poet and editor ‘not morning people’, this arrangement was a compromise with no siesta in sight. I just read your question again, and it referred to subject matter. I suppose I should say I am moved to write by both internal and external events, that sometimes I am moved to write by personal, autobiographical events, other times by the need to witness or weigh in on the way history is pouring through the sluice of our moment. The subject matter sometimes isn’t clear to me when I begin. Especially in poems of a personal nature, especially in poems of mourning or sorrow. In those poems, the poem, bodying forth slowly over time — and many drafts — teaches me what I am really struggling to know. The poem helps me sneak up on myself, helps me eavesdrop on the various personae that make up my identity. The comic Steven Wright once quipped that he sat down and read the dictionary — he thought it was a really long poem. That’s a laugh, yes, but it also seems to me true! In a poem I am trying to ‘come to terms’ with something, and those terms, words, are the English language, influenced by centuries of history, and inflected by my experience as a poet and lover of poetry in this time and place. I love the notion of the poem sneaking up on yourself, and for the generous answer as to subject matter and inspiration, and the honesty about this time and place of worry and fear. This may seem glib, also, but although I detect a wide range of subject matter in your work, I definitely feel that the two books I have read speak to each other (glib again), are connected in an essential way. I felt rereading the books again today that the poems at the end of Gold Star Road was continued with the inscription at the beginning of Emblem: ‘Words indicate, things are indicated, but things can also indicate’ – Andrea Alciati. But I am conscious I haven’t read your most recent book (Noon Until Night). I am five years behind on your work! Perhaps you could offer a precis of your work to date for our readers? We are in a different time and place with regards to your work and its development, but we exist in the same world, and I share the fear and sadness at the state of world politics and the future (but sometimes I hide from this reality in Literature). Cold Star Road was written in the run-up to the Iraq War and then as that war continued. In composing the book, I was aware that I was raising questions about fathers and sons and war and violence and grief and a militarized masculinity. In the US, there is a Gold Star Road or Gold Star Street, in nearly every town across the country — and the change of street name after WWII was to acknowledge the street which had suffered the greatest number of combat deaths. It seems macabre, in a way, and a rationale for what America became after that war. Emblem is studiedly looking to the past for help, from the grandma in the first poem, through Andrea Alciati’s emblem book from the Renaissance. I felt that in some ways we are in a kind of explosion of new knowledge and technologies, like the Renaissance, and that like the Renaissance, we need to look backward (as if history had a direction, ha!) to see what understandings we have been bequeathed that might be a steadying hand on the tiller as we head into uncharted waters. Alciati and others had the newly rediscovered Greek Anthology to help them make sense of human conduct, and Alciati, a jurist, an urbane skeptic, wrote in imitation of the portrait of human nature he found there. So I wanted to try something like that because I felt the need for it. It’s also a kind of dissent: American culture has been completely overtaken by commerce so that our understandings of human nature have become sentimental on the one hand and cynical on the other, and only art or even discourse (including poetry) that can be monetized for profit is valued. My new collection, Noon until Night, continues the personal/political dialogue, but because I’m getting older, I am looking at things from a more philosophical perspective, considering mortality and what it means to me that time’s winged chariot has become all too audible. Thank you for that astute and erudite precis and appraisal. Yes, there is a philosophical aspect to your work (one of the advantages of getting older!) and vibrant conversation keeps winged chariots at bay. I am sure someone said all Catholics are writers, or frustrated writers! I am with you on the importance of going back (if history had a direction) for the lost way of truth and certainty, emblematic or otherwise (more truth, less dread). This is unrelated, but I have been banging on about the wisdom of Ernst Schumacher’s Small is Beautiful for years but no-one listens! And horror at the house-painter’s speeches. Drives me to my desk. A lot of what we’ve been talking about is really the struggle to bridge the spiritual or aesthetic with the need to witness, in both cases, I take on the responsibility to try to say, first for myself but also for others, what seems to need to be said. I lately wrote a vignette about Brecht and Rilke meeting in a dream I had. I’ll attach it, just for kicks. Print it if you like or just enjoy it as a corollary to this conversation. In the dream, Brecht and Rilke are having lunch and I’m their waiter. I recognize them  Rilke’s doe eyes and moustache, Brecht’s balding bowl-cut and glasses. I try not to show my excitement. I only understand, from hearing it in childhood, a little bit of Deutsch. Brecht keeps trying to turn the conversation to something about an apple tree in blossom but Rilke, panicked and very near tears, is begging Brecht to fill him in on all that happened. The old woman in the kitchen putting up the steaming plates of wurst and schnitzel is my German grandmother. I tell her what little I understood. She wonders, aloud, what in Gott’s name these poets are doing in Pennsylvania. Before I get to the other two questions, you just made me think about why many poets dodge the political, especially questions of economic justice, which is how moral crises become political in our lives now, in late capitalism’s nightmarish organization of human energies, a kind of global plantation. It was Pound! Pound! After him, what poet in his right mind would say, ‘I’m a poet, and I want to discuss economic theory. Do you have a minute?’ People will slam the door on you faster than on a Jehovah’s Witness or a vacuum cleaner salesman! But of course it is the life of the poet, or maybe the artist in general, that still remembers what words like ‘value’ and ‘enough’ mean. Good luck. About teaching and writing: the poet Theodore Roethke said that teaching is the last of the professions to permit love. I agree with that. I love guiding and encouraging young people. Roethke also wrote, ‘A teacher, I exist to save the young time.’ My pedagogy is encouragement. Period. I am no gatekeeper. Oh, and the offering of relevant examples. Oh, and the communication of my love for an art that in many ways saved my life. A lot of programs operate on the workshop model. Without turning students into mere consumers, I am aware that they are investing a good deal of money in this phase of their education as writers. Roethke said, ‘A teacher, I exist to save the young time.’ I have content to bring to our conversation. I am not merely the chairman of a meeting called a workshop. I hate the word facilitator. We wouldn’t just hand medical students a scalpel and a cadaver and let them decide together what this thingamajig is and what that whoozeewhatsis is for; writers are cultural doctors. There is a body of knowledge to be imparted. My boyhood had little or no poetry. I was raised in a working-class household with two of my three brothers dying of muscular dystrophy. I was beaten at home and raped by a coach. I started writing poems in high school, but I had to hide them. It was dangerous in that place and time. There was an inordinate fear of any such thing, a fear related to an intense and intensely ignorant homophobia. I was quarterback of the football team, for crying out loud; I couldn’t be writing poems! But I did write them and hid them between the mattress and box spring, next to my secret copy of the Bantam paperback edition of The Poems of John Keats. Keats legitimized joy and sorrow and writing about feeling. I think that hidden book was the only book in the house. though they are far out on the water. the chimera, the apparition in the window. to sing the creatures into harmony, not change their natures. does not know what to make of what’s become of you. closed eyes everywhere he looked, but his were opened. the rest of us, for several thousand years, could not recall. or calm, adventure or repose, a promise or fulfillment of a promise. to believe therefore that no one has ever wanted to. and even silence, is a toy that you, an aged angel, have outgrown. xxxxxxxxxxxxxxxxxxxxxxxxand carried you out of there. and fierce young men, and make war. But a king who will kill a poet out of fear? There remains no evil on earth he will not do. could be so construed, I would wish you rest. NOTE: The poet Hashem Shaabani was executed on January 27th, 2014, by the Islamic Republic of Iran for Moharebeh, i.e. ‘waging war on God’ and for opposing the republic by promoting Arabic culture. A SCAR. A FEAR. A WAR. AN EAR. but the scar cannot afford such. or even a special kind of gesture. refreshing itself with opened flesh. of what?” he asked himself. The dark? The cold? Spiders? Blood? Who were my mother and father? He feared the moonlit answer. candy to children on either side. the candy made them hungrier. That’s the kind of candy it was. swarming on their still wet eyes. holds up or is false and useless. threatening to ring every bell at once. this time by my mother. Burn, go on and burn. Go on. On and on.